Grits. You either love them or you hate them. There is typically no in between ground there. No gray area where someone is a little iffy and be swayed one way or another. I am definitely a grits lover. I like them with a good bit of salt, pepper and a ridiculous amount of butter. This year I discovered something surprising…grits are so delicious with garlic and cheese in them. I mean really, really delicious. Creamy, cheesy with just a hint of garlic to them. Topped with more cheese…they are a wonderful accompaniment to any brunch. I told ya’ll this week I was doing “blog about brunch”…I will say again…I am a fool for some brunch. This grits casserole can find a home on any brunch table. I have so many brunch recipes that I am not sure I could share them all with you over the course of a week or two…but I will round up some of my faves. The other day I gave ya’ll the breakfast danish casserole. Score one for Cajun Mama cause that baby is a winner. Anyway, this is another excellent addition to your brunch recipe repertoire (say THAT 3 times fast!). Like anyone, I tend to reflect as one year comes to a close and we usher in another. I guess the time for reflection and taking stock comes for all of us at this time. I hate to put too much emphasis on these days because for some it is such a hard time to get around and most of us are ready to move on to another year. I don’t know what kind of year it has been for many of you. For me, it has been good and fast paced but also has brought many things to light. Some good and happy. Others not so much. But I do know this..and I hope you do too…I am where I am for a reason. It is part of my path. Just like finding these cheesy garlic grits are part of my destiny (I am not kidding…they are that good! ), so is whatever you are doing or where you are at this moment. I will not get all deep because I know ya’ll probably don’t get on here to listen to my insights about life..also because we have some family coming in for New Years Eve. I have cooking to do. Shocking…I know. I will only say this…my in laws came in the other day to celebrate our Christmas. They wanted to take pictures in front of the tree. I took some of them and the kids. They wanted me to get in there. I had no makeup on. My hair was not really fixed. I didn’t know how my outfit would look. I don’t consider myself a vain woman, but I am a woman. Taking an ugly picture is not really ever my goal. 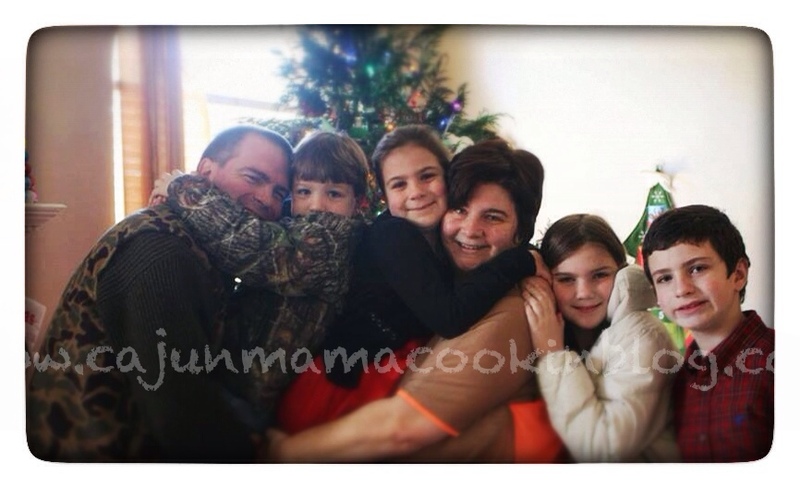 But I decided to be grateful for the moment to take pictures with my precious family. To BE in the moment, instead of wishing to be somewhere else or look another way. I ended up loving the picture because it captures our joy as a family. The fun we always (ok…well usually) have together. Being in the moment is not easy for me. I tend to want to jump ahead or look behind. But the good stuff, however not perfect it may seem, for me, is usually right where I am. Even if I cannot see it or appreciate it at that moment. So today, I hope you can look around and see the beauty in where you are. In this moment, or the day, or of your life. Every moment has something to offer and teach. Even the imperfections (and mine are so many) can be beautiful. Anyway, enough of that. The focus here is cheesy, garlic, yummy, creamy grits. Make them. You will be oh so happy you did. Much love and many blessings to all of you. Preheat oven to 350 degrees. Lightly grease a 11 x 7 inch baking dish. Bring milk just to a boil in a large saucepan over medium high heat. Whisk in butter and grits a little bit at a time. Reduce heat and simmer, whisking mixture constantly for 5 to 7 minutes, or until grits are cooked. Remove from heat. Stir in lightly beaten egg followed cheddar cheese, salt and pepper. Add in finely chopped garlic if desired at this time. Pour into prepared dish. Sprinkle with grated Parm. Bake at 350 for 35 to 40 minutes or until mixture is set. Serve immediately. Yummmmm!!!! The epitome of southern dishes, right on your kitchen table or brunch buffet table. Be sure to take a nice long whiff of the garlicky aroma before digging in. I also sprinkle some Tony’s on it before serving. Adds just a hint of spice and a nice kick of color. We just made the same casserole you made for us on New Year’s breakfast. 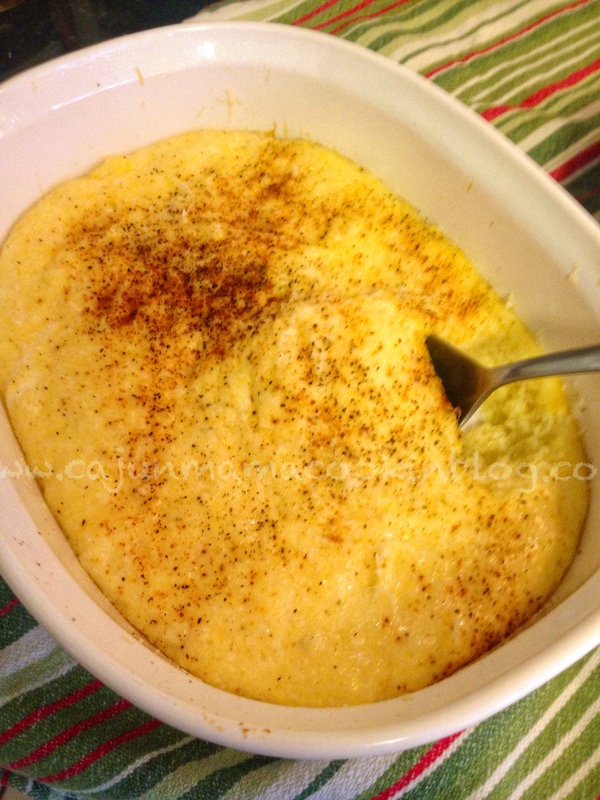 Now I am going to have to try to cheese grits~ likely my favorite!~~! Thanks again for the inspiration! Aww! Thanks Lolly!!! So glad ya’ll enjoyed it. The grits are divine!!! You are welcome and thanks for the same. I don’t think there is cream cheese in this dish. Cheddar cheese and Parmesan cheese.